When EU Presidents Donald Tusk and Jean-Claude Juncker brief the European Parliament in Strasbourg this morning, they’ll have no clue what might unfold in London just a few hours later. After seizing the Brexit process from Theresa May, the U.K. House of Commons will vote on a series of alternatives to her divorce deal. Most of the options — apart from exiting the EU with no agreement or giving May’s deal another try — would require a long delay to the divorce, a bitter pill to swallow for Brexiteers and not without opposition in some corners of the continent. Final Straw | A plan to ban plates, straws and other single-use plastics cluttering the world’s seas is set to clear the final political hurdle today with a vote at the European Parliament. EU governments have already signaled support for the draft law, so their final approval, slated for next month, is more of a formality. Polluting Caps | The EU wants electric cars on the road and a vote today could make that happen more quickly. European lawmakers will vote on tougher emissions caps for vehicles, including specific carbon-dioxide targets for 2025 and 2030. Governments are likely to give their rubber stamps next month. Taking Benefits Home | Nations with a lot of migrant workers, like Germany and the Netherlands, aren’t happy with an update to unemployment benefits being debated by EU ambassadors today. Critics argue workers would have little incentive to find new jobs. Wooing China | Europe’s preening for China continues as Luxembourg Prime Minister Xavier Bettel heads to the Asian country for bilateral talks with his counterpart Li Keqiang. The pair may sign a number of accords, just days after the leaders of Europe’s biggest economies entertained President Xi Jinping in Paris and Rome. Trust Xi | As Europe struggles to come up with a coherent position on China, President Xi has a suggestion: just trust Beijing. During talks with European leaders yesterday, he sought to lay to rest suspicions about his global plans amid mounting concern over China’s growing influence, predatory investments and possible hacking of 5G data networks. Calling Time | Daylight-saving time could come to an end across much of Europe after the European Parliament voted to force governments to choose between staying permanently in wintertime or summertime in 2021. Now theonus is on member states to decide. Online Media | Google, Facebook and freedom-of-speech activists suffered a blow after European lawmakers rubber-stamped new rules that could curb access to online media in Europe. Once in effect, publishers, music and movie producers are likely to chase online platforms for money in exchange for displaying their content. Swedish Intrigue | As Sweden gets to grips with the money-laundering scandal battering its oldest bank, questions are being asked about the impartiality of those overseeing the case. Concerns are now being aired that old friendships and former career ties may have shaped the way the Swedbank allegations were handled by people at the nexus of power. In Europe, whether you like or hate low interest rates depends on where you live — and your savings behavior. 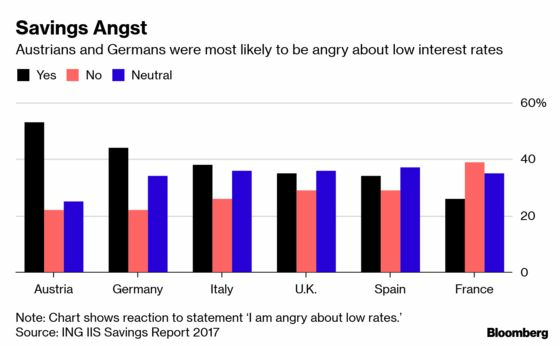 A majority of Germans and Austrians answered ‘yes’ when asked if they were angry about low rates, whereas in southern nations like Italy and Spain, people were more likely to welcome cheap borrowing costs. That’s not just because those economies are weaker — research suggests that culture and language foster different attitudes about financial risk.